Rabies is a fatal disease that is spread to humans by infected animals. Although the risk of rabies in the Simcoe Muskoka is low, precautions such as getting your pet vaccinated against rabies, will help to keep you, your family, and pet stay safe. The health unit works to increase public awareness of rabies and to prevent its spread in our communities. 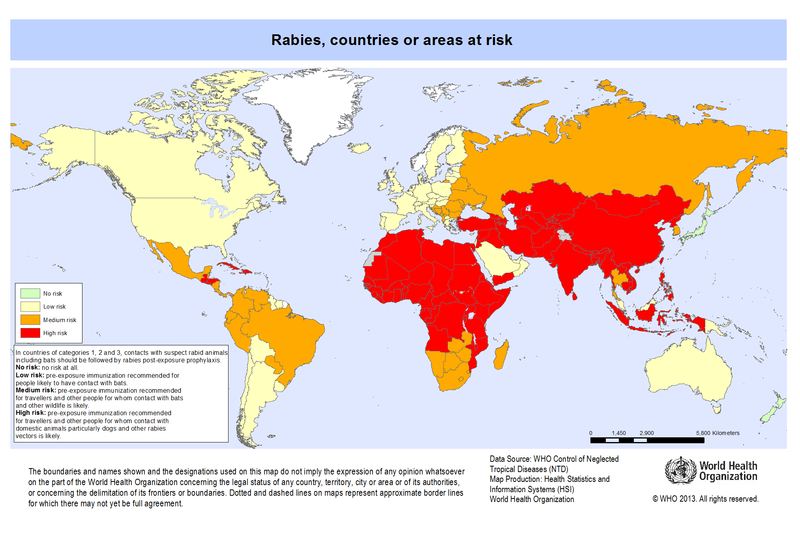 Investigate all possible rabies exposures to prevent the spread of rabies to humans. Provide rabies vaccine and expert advice for clients and their health care providers when rabies exposure is suspected. Promote the vaccination of domestic animals against rabies. Rabies rates in Ontario are on the rise. Protect yourself and your pets against rabies by getting them vaccinated. This is the law in Ontario. If you have been bitten or think you have been exposed to rabies, please call us. These incidents must be reported to the health unit for investigation. For more information, please call Health Connection and ask to speak with a public health inspector at 705-721-7520 or 1-877-721-7520.